Do you like Flan? 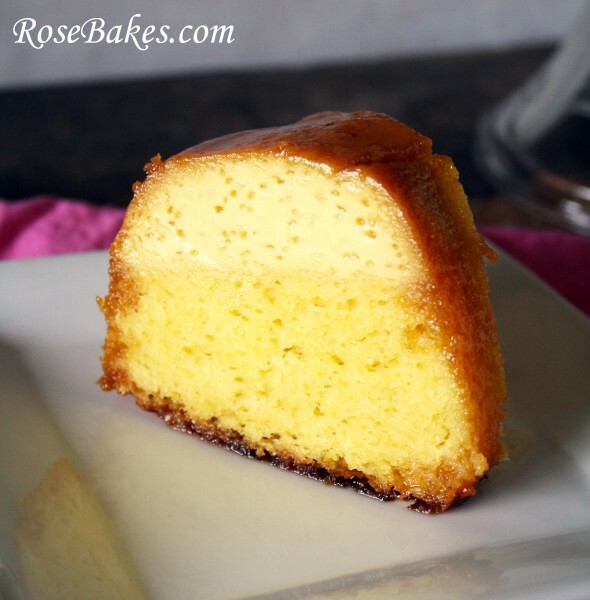 Have you ever had Flan Cake? I have wanted to make this recipe for my Mama for quite a few years now and it seems like I never get around to it! Well this year is the year… I have done it! You see, my Mama loves Flan. Usually she can’t remember what it’s called … it’s just “that dessert they have at the Mexican restaurant”… but I always know what she means. And she doesn’t read my blog so she won’t know I’m picking on her… 😉 ! Anyway, several years ago, Richy’s grandmother (who was officially called “Mom” by all of her children, grandchildren, and great-grandchildren) made this Flan Cake while we were down in Florida for a visit. And while Flan is not at the top of my list of favorite desserts, the Flan Cake was really, really good and I knew my Mama would love it! I asked Mom for the recipe and she happily shared! Unfortunately, recipes don’t make themselves, though, so until now, it’s just been one more piece of paper in my recipe drawer. Actually, I looked for it a few years ago to make it and couldn’t find the recipe, but during out last move, it reappeared! Let me start by saying that my bundt pan is clean. I promise. I probably could use a steel wool pad and some elbow grease to get all that residue out… but I’m sorta lazy… so it’s um… a little stained. 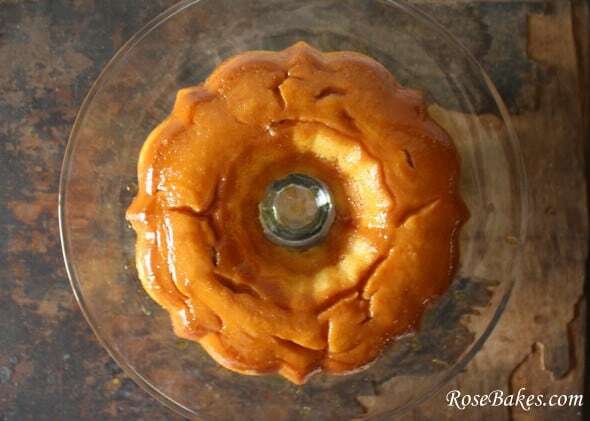 Anyway, for this cake, first you’re going to want to caramelize some sugar and pour it into your bundt pan, then swirl it around to coat the sides. Or you could buy cajeta (pre-made caramel topping)… which would’ve been great for me to have on hand considering I burnt my sugar twice before I got it right. Ugh. If you need help with the whole “caramelizing sugar” thing… check out this link. Clearly I am not qualified to give out instructions! See? I burned it bad the first go around. 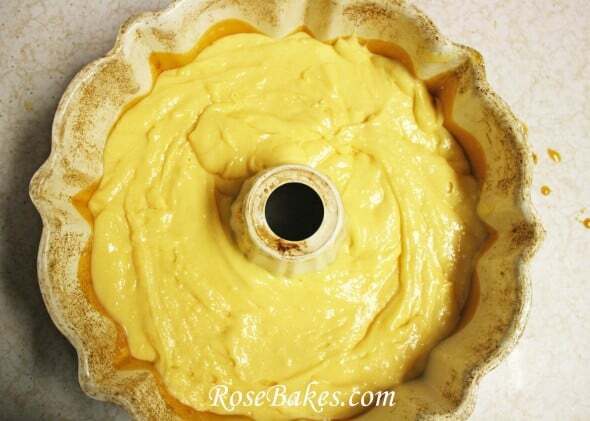 Then you’ll want to mix up a yellow cake mix according to the box directions. Or a chocolate one. Or any other flavor you like…then pour it over the caramel. I used yellow because that was listed as “preferred” on Mom’s directions, but I also remember her telling me that chocolate was really good! Last, mix up the milks, eggs, and extracts and pour that on top. The cake mix will float to the top.. that’s okay! It’s supposed to happen. Do you have any questions about this recipe? As long as it doesn’t have anything to do with caramelizing sugar… hehe. Add the sugar, water, and lemon juice in a saucepan over low-medium heat. Stir until you have a wet sand texture, then continue cooking the sugar until you have a clear and amber colored syrup. Do not stir while cooking. Remove from heat. Spray the pan with non-stick cooking spray then pour the sugar into a bundt pan turning it until the pan is coated on the inside. Prepare the cake mix according to package directions and pour the batter over sugar. In a separate bowl, mix 1 can condensed milk, 1 can evaporated milk, 4 eggs, 1 tsp. each of vanilla, brandy, and almond extract. Pour over batter. The batter will float to the top… that’s okay! 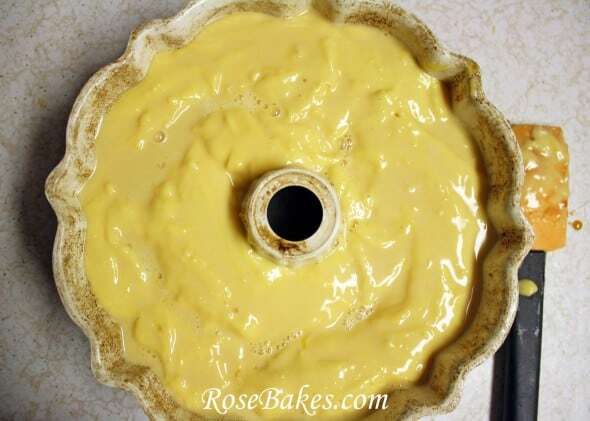 Place the bundt pan in a larger pan (I use a round cake pan) with 1/2″ of water and cook at 350 degrees for about 45 minutes. Cover with foil and continue to cook for 20-30 minutes more or until done (check with a toothpick).. Place cake on cooling rack. Remove the foil and cool 15 minutes then invert onto serving plate. Cool 1 hour at room temperature. Chill 4 hours or overnight. Mom always told me that this cake was also delicious with a chocolate cake mix, but I still haven’t tried it that way! Now that looks good!! Thanks for sharing this with us @ the Sunday Round Up. Flan is a great dessert! love how yours looks i the pictures. Thanks for sharing at our Sunday Round Up! Can’t wait to see what you have for us next weekend. Have a GREAT week! What size are the milks? small or regular size cans? I apologize for leaving out that important detail!! I have updated the post to reflect the can sizes!! Hello, I love this idea for a cake. Now im a little confused, im familiar with making the flan and understand why we have to put the pan into another with the water but you mentioned to cover it with aluminum foil to cook for 20-30 mins more: Is that inside the water still or jst on the regular oven rack ? I make this Flan this past weekend. I could not believe how delicious it was. I’m making it again for my sister’s Birthday on Halloween. Thank you for the recipe! Sooo happy to hear it! Seriously that could be my bundt pan it’s such a pain to get to all those cracks and crevices! 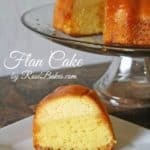 I had heard of something called choco-flan and it is similar to this flan and cake together! 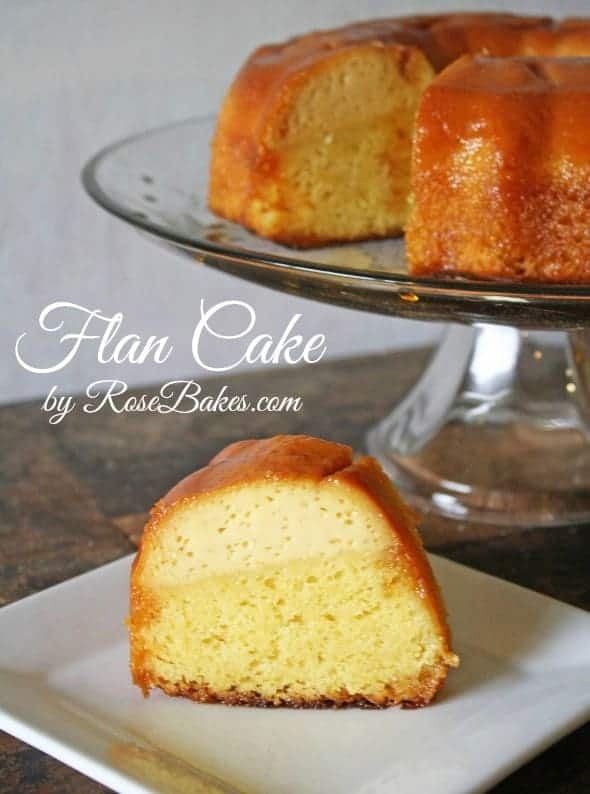 Wanted to try i love flan but the family loves cake so we can compromise i get the Flan dessert part they get cake and we all have dessert! Perfect! Quick question does pan need to be greased before hand at least on the sides? Thanks so much for sharing this is tomorrows dessert! Eeek – I can’t remember if I greased the pan or not. I’ll have to dig out Mom’s recipe and see if she says one way or the other! So sorry – I only make this cake every couple of years or so and I really don’t know! Just made this tonight and it is great! It is so impressive how the “flan” rises to the top like that. The only problem I had was that it stuck a little in 2 different spots, but it didn’t ruin it. I don’t know if it should be greased or not, either. I’m a little afraid to do so because it might interfere with the caramelized sugar. But, it looks great and tastes wonderful! Thanks for something very unique. anyway thanks for sharing the recipe! Rose could you clarify if pan needs to be greased or not? It sounds like Lana didn’t grease it and had minimal issues removing from the pan after baking so I’m assuming it isn’t required? I also thought greasing the pan would interfere with the caramel coating the pan. I actually don’t spray the pan and it doesn’t seem to cause a problem BUT I’ve read other similar recipes that suggest spraying it with non-stick spray, so I think either way would be fine. For the caramel, I suggest keeping it on low heat the entire time and babysit the sugar so it doesn’t burn. 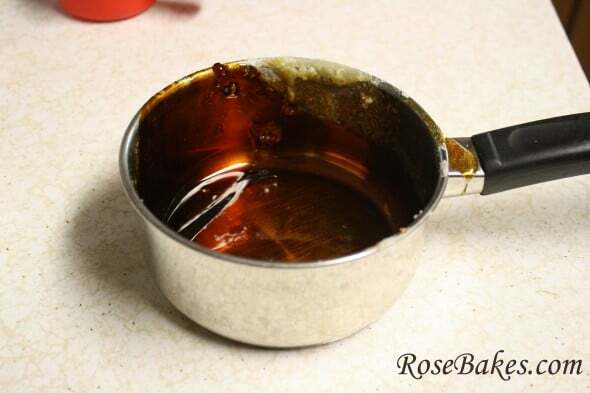 I’ve always done it without the water and just stir it with a wooden spoon, the caramel slowly melts and the end result is a rich caramel flavor. As far as pre-greasing, I suggest making the caramel first and then greasing the rest of the pan. 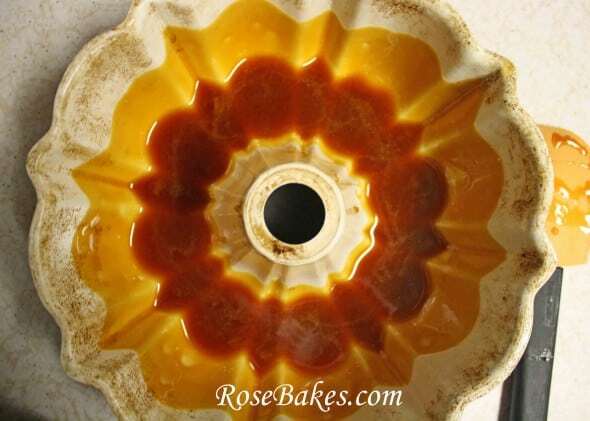 If cooked correctly in a water bath, the caramel should melt nicely and the cake will not stick. Happy baking! I think it’s a 9″ pan! Thank you! Possible to make in cupcake cups or mini bundt pan??? Oooh, I don’t know. It would be interesting to try though! When cooling for the 2-3 hours, is that in the pan on a cooling rack? 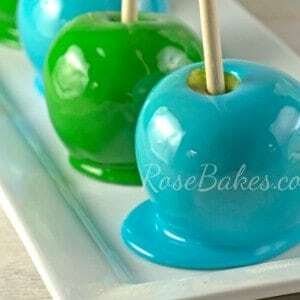 Or do you flip it over onto a plate and cool in refrigerator? I’ve done it both ways – flipped it onto a plate and left it out or flipped it onto a plate and refrigerated. I just made this cake and took it out of the oven. It seemed to cook rather quickly!! You said to cool for two hours. When do I invert?? Made the flan cake. Made it with a german chocolate cake. Wow, delicious!!! My family loved it!!! Will be trying the yellow cake too. I feel very stupid but I cannot seem to find the actual recipe. I am looking at this from my phone so maybe it has something to do with that? If you could post the link directly maybe that would help? Thank you. I’m so sorry. I’m working to get this fixed asap! In the meantime, I’ll email you the recipe. I spray the pan with non-stick spray. Then when it’s done baking, place cake on cooling rack. Cool 15 minutes then invert onto serving plate. Cool 1 hour at room temperature. Chill 4 hours or overnight. Awesome! 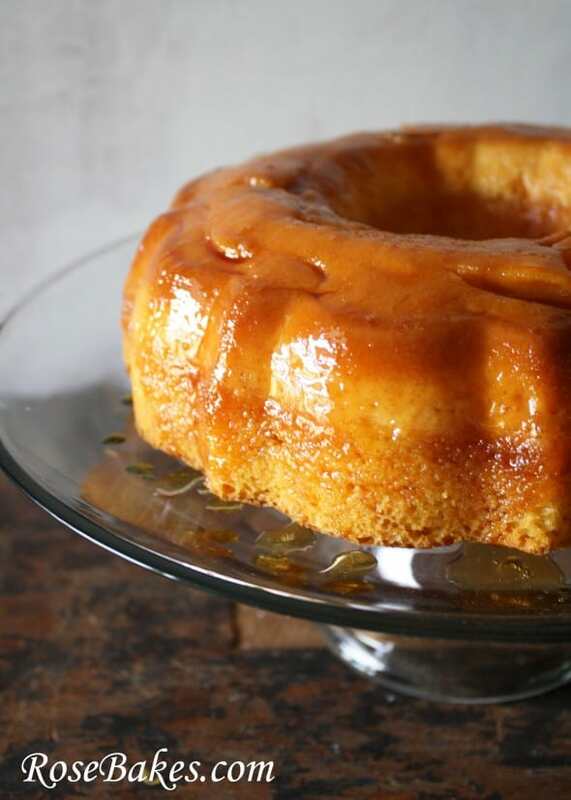 You might try using a different caramel recipe or even the jarred kind from the store! Thank you! I hope you love it as much as we do! Happy Holidays! Looks good! Thanks for sharing with us at the Merry Monday Link Party. Hope to see you again on Sunday night! Hi! I’m in love with the idea of this cake! Can’t wait to make it. Just wondering if I should invert it right away or let it cool overnight and then invert. I’m just afraid the flan wouldn’t be set that soon? Please help! Hi Sherilyn, thanks for stopping by the blog! The last step of the instructions mentions to put it on a cooling rack, cool 15 minutes then invert onto serving plate. Then you cool 1 hour at room temperature, and then chill 4 hours or overnight. Hope that helps! Awww, so happy to hear it! If I don’t have evaporated milk can I use regular one. I’m not sure how that would work in this recipe. Should I leave it in the pan to cool and chill or pop it out first? Hi Sandy, thanks for stopping by the blog! The last step of the instructions mentions to put it on a cooling rack, cool 15 minutes then invert onto serving plate. Then you cool 1 hour at room temperature, and then chill 4 hours or overnight. Hope that helps! 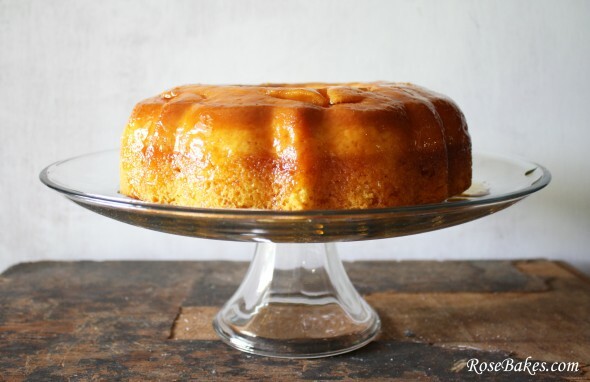 Thank you dear for sharing such a amazing recipe, I have a question that if I am using a store bought caramel sauce, how much (in ounces) shall I use??? take care. I didn’t really measure. I bought a small jar (I think it was 8 oz.) and just drizzled it until the bottom was well coated. Thanks so much, you are such a sweet person, stay blessed. This looks delicious, thinking of bringing it to my company xmas party. I’m wondering if this will hold up in the fridge if made 2 days in advance. Do you think it would get too soggy with that amount of sitting time? Thanks! You know, I’ve only ever served this after chilling overnight. I’m not sure how it would hold up if kept for more than that. This recipe was so frustrating! I tried making the caramel and when I finally got the right color, the sugar seized up and turned rock hard immediately. Then I substituted some jarred caramel topping and baked it, but after letting it cool for 15 minutes tried to turn it upside down and the whole thing completely fell apart. Should have been completely chilled in the fridge before taking it out of the bundt. Flavor is good but it’s a big mess! Some recipes do recommend allowing it to cool for up to an hour before flipping it out I’ve never had to wait that long and it turns out beautifully. I’m sorry you had such a hard time. Looks so yummy! Thank you for sharing on Merry Monday! Have a great week! 1- Shame on you for picking on your mom. (mine reads my blog so I can’t do it, though I am sorely tempted). 2 – I can’t caramelize sugar to save my life. Thanks for sharing on #TastyTuesdays. Oh, I think I’ll try making this for my husband’s office soon. I just hope I can help myself from stealing a big chunk of it before sending… LOL… I’m addicted to caramel. I made the Flan Cake, it’s a beautiful cake and very delicious!!! Thank you for sharing:) I wanted to share a photo , wasn’t able to load. I just found this recipe on Pinterest and can’t wait to try it out! It seems pretty straight forward and can already imagine the demand for more! thank you for sharing. After cooking with it covered is the toothpick suppose to come out clean? Hi Rose, I just printed this delicious recipe to try asap. I would use the caramel store bought topping. I noticed this can be done with chocolate cake as well. Do you think this one could be made using chocolate topping? not sure if it would turn out the same as the caramel..